SPOILER ALERT: This post is grumpier than usual. Read at your own risk. The 10:45 AM service for the First Sunday after Christmas was billed as “First Sunday after Christmas: Lessons & Music.” In his “Music Notes” in the bulletin, Doug Starr wrote about the Festival of Nine Lessons and Carols that is celebrated at King’s [“Kings” in Doug’s writeup] College, Cambridge every year in the late afternoon on Christmas Eve. I don’t know why we don’t call our service “Lessons & Carols,” but the fact that we don’t is a tip-off that the St. Paul’s version, despite many commonalities, is not quite what is done in England. On the afternoon of December 16, I actually attended a Festival of Nine Lessons and Carols at St. Andrew’s Episcopal Church in Highland Park. Except for the fact that the choir included females, the service was about as close to the King’s College version as one could expect to experience in the U.S. We didn’t pray for the Queen, of course, but the church was lit by candlelight, the first verse of “Once in royal David’s city” was sung a cappella by a boy soprano, and the lessons were read by members of the parish and the community. (Readers included the rector, the bishop, a Roman Catholic deacon, and a state senator.) The “carols” were mostly arrangements sung by the choir; a few were hymns sung by all. The service was magnificent. Years ago, St. Paul’s put on a service much like that of St. Andrew’s late in the afternoon. In recent years, however, the service has been translated to Sunday morning. This created a quandary—shouldn’t there be a Eucharist at the principal Sunday service? For a time, we simply ignored the problem and did a lessons and carols service without a Eucharist. Apparently, we’re not doing that any more. Unfortunately, adding a Eucharist to the lessons and carols format, even without a sermon, necessitates some cuts if one insists on keeping the length of the service below 75 minutes. The nine lessons of the Cambridge service became six today. One might quibble that the choir prepared no music specifically for today’s service—a departure from what was done years ago before the service was moved to Sunday morning—but I don’t think that worshipers were shortchanged. Lovely solos were sung by Sue Vines and Brian Brazon. Sue and Cathie Buschek played a four-hand postlude. Alexandra Thompson played a cello solo and accompanied other pieces, as did Tommy Starr on tympani. Katy Williams filled in for the boy soprano on the processional. There was some confusion as to who was reading which lesson, which resulted in Chris Thompson’s reading two lessons. As is usually done at St. Paul’s, choir members read most of the lessons. (The rector read the last one.) There always seems to be confusion about how the lessons are to be introduced and concluded. In the King’s College service, lessons are introduced by a brief description and concluded with “thanks be to God.” I may not have been paying close attention, but, if memory serves, some lessons were introduced with a description, and others were introduced with a citation. All were ended with “the word of the Lord,” to which the congregation naturally responded “thanks be to God.” Maybe next year, we’ll get it right. One of the minor joys of the December 16 service at St. Andrew’s was the continuity of the service. No one was telling the congregation to stand up or sit down or turn to a particular hymn in the hymnal. Everyone simply followed the program like an adult. (Well, it must be admitted that it was so dark in the church that one had to struggle to read the program. St. Andrew’s does not have the ability to dim lights without turning them off as St. Paul’s does.) In any case, Lou apparently fails to appreciate how annoying and insulting his stage directions are. Many parishioners agree with me on this point, though I suspect few share my visceral aversion to the practice. When I hear “we will now stand and sing hymn —,” it is all I can do to avoid running out of the chancel screaming. From my vantage point in the choir and with my experience as former Audio-Visual Coördinator and member of the Worship Committee, I cannot ignore problems with the physical environment. The good news today is that some of the spotlights that had been burned out for weeks (perhaps months) were working today. Of the five spots that had been non-functional, three were working last Sunday, and four were working today. I was pleased to see that one of the down lights at the crossing was working. I have no idea how the bulb was replaced—it is the most difficult bulb to replace in the entire church—nor why the bulb on the opposite side of the center aisle was not replaced. A few weeks ago, I told Lou about the lamps that were burned out. The spotlights were at the top of my list, but I also noted that two lamps in lanterns were out, as was one lamp in the north aisle. Those lamps were still out today. Moreover, another lamp in the north aisle was also dark. The most upsetting glitch in the decoration of the church was the presence of a lighted Advent wreath. We are done with Advent, people; this is Christmastide. We need to put the advent candles away for another year! Speaking of candles, the pew candles were installed and lit today, as were the candles in the windows. This frankly looked silly, as the electric lighting in the church was as bright as it ever is. Candlelight only works when lighting is dim enough to allow the candles to have a significant effect on ambiance. I wonder if the candles were lit—presumably like the Advent wreath—simply because no one had bothered to put them away. If we were were going to use candles, the electric lighting should have been much dimmer. There was one other lighting glitch. Neither the light on the pulpit nor the light above the pulpit were turned on. Switching these lamps on is often forgotten, and it was unfortunate that they were off today, as all the lessons were delivered from the pulpit. I should also mention that, for today’s service, we used the two microphones dedicated to the choir. Given the size of our choir, it isn’t clear that we ever need these microphones, but someone clearly thought it was a good idea to incorporate them into our new sound system. Generally, we haven’t been using the microphones, but we did today for the two anthems sung by the choir, the Victoria Ava Maria and the Sedio arrangement of Coventry Carol. I would be interested in learning if using the microphones enhanced our music. One microphone was pointed toward the men singers. This might have been useful, as I have heard complaints that the men are often difficult to hear, perhaps because many of us are standing behind the organ console. The other microphone was not so much pointed toward the women singers as behind them, so I doubt it proved of much utility. I suspect that most worshipers at 10:45 thought the service was lovely. At some level, it was, and it certainly had its high points. For me, it was marred by the presence of the Advent wreath—this was an unforgivable liturgical error—by lighting that failed to create the atmosphere the service deserved, by a lack of attention to certain details, and by incessant and unnecessary directions. I pray St. Paul’s will do a better job next year. I will certainly plan not to miss the Festival of Nine Lessons and Carols at St. Andrew’s in 2013. Freed from obligations related to Refuge, the task for which he was hired, Bryan Sable took on the task of resurrecting St. Paul’s handbell choir. I have always wanted to try playing handbells, so I volunteered to be part of the new choir. Perilously close to Christmas, we began practicing for a Christmas Eve debut. Prior to Christmas Eve, St. Paul’s new group of ringers had only two real rehearsals, with a different mix of personnel each time. A third rehearsal was cancelled because most people could not attend. We were slated to have a quick practice before the 7:30 service on Monday, but we spent most of our time setting up and getting organized. Not everyone showed up on time. If you’ve never played handbells, it may not be apparent how problematic it is not to have the same ringers present each time you play. In essence, each ringer is a piece of an instrument. Remove one ringer and the instrument has to be reconfigured or parts of it simply will not play. I was never quite sure which bells I would be responsible for when we finally played in church. As the only male in the group other than Bryan, I was assigned to handle the lowest (i.e., biggest) bells. My assumed qualifications for this were strength and the ability to read bass clef. The advantage of the assignment was that I was not constantly ringing, and I didn’t have to master the technique of ringing two bells in one hand. Our group may not have been sexually diverse, but we were certainly diverse in terms of experience. The choir included the likes of Jan Toth, who always looks cool and competent, as well as others who at least had some handbell experience. My knowledge of handbells, on the other hand, was limited to watching ringers rather uncritically and with a sense of awe. I quickly realized that the ability to read music is useful, but it is not the most important handbell-playing skill. The critical facilities are mechanical and mental ones: remembering which bells are in which hand, switching bells quickly, ringing bells reliably and consistently. My hardest job was ringing two bells at once and immediately ringing two different bells at once. At our last full rehearsal, when I tried to ring the D4 bell, the handle broke off in my hand and the casting (i.e., the bell proper) fell to the table. (Maybe it was the D3 bell. I’m still learning which bell is which.) This was inauspicious. The handle is a flexible plastic strap, and it snapped off in the two places where it met the bell. Examining the damaged instrument, it seemed that it contained, as they say in the consumer electronics industry, no user-serviceable parts. It was not clear that we would have a usable D4 bell for Christmas Eve. Bryan came to the rescue. He consulted the manufacturer, which promised express delivery of a new handle assembly. What neither Bryan nor I realized was that, although there was no way to replace the strap, which was attached with four rivets, the entire handle assembly attaches to the casting with a small bolt. A completely new handle assembly arrived at St. Paul’s on Monday. There was good news and bad news in having a working D4 bell. Obviously, having the bell had the potential to improve our performance. 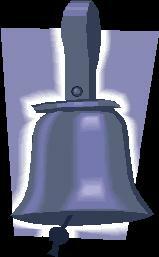 The bad news, of course, was that I had one more bell to handle. 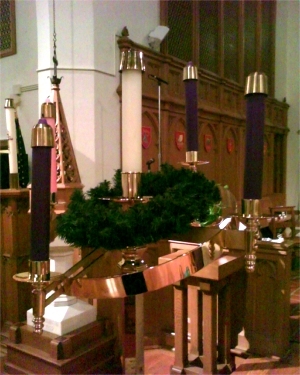 For the 7:30 service on Christmas Eve, the handbell tables were set up in the church behind the last pews in the nave. We were to play an arrangement of “Away in a Manger” before the service and “Silent Night,” along with the organ, near the end of the service when the hymn was to be sung by the choir and congregation. For much of Monday afternoon, I was watching instructional videos on YouTube. (Yes, there are such things.) I did pick up a few useful tips, but the overall effect of my watching these videos was to increase my already high anxiety about the evening’s performance. I suddenly realized just how much I didn’t know about handbell playing! We had essentially no practice time Monday night. Our performance, though certainly not a disaster, was well short of adequate. In addition to the problems I was already having, mostly related to switching bells quickly, I experienced two other problems I did not fully appreciate. I don’t know if everyone was as affected as I was. Just before we played “Away in a Manger,” I had the fleeting thought that we should perhaps tell the ushers to keep people away from the ringers as we played. Deciding that I was being obsessive, I failed to act on my concern. Big mistake! As we began playing, worshipers walked behind me in a steady stream. My problem with this was not simple claustrophobia. My problem was that the piece began with tower swings, a movement involving ringing the bell in front of me and swinging it backward as if it were ringing in a bell tower. The fact that I was actually hitting people as they passed behind me did not stop the flow of people. (What were they thinking?) I was very much rattled by this and did not recover easily or quickly. The second problem was anticipated. “Silent Night” was to be played in relative darkness. I asked Rich Creehan to give us more light than he had originally provided, and he obliged. We never practiced with the organ in dim light, however. The task turned out to be much harder than I expected. It was difficult to get my face close enough to the music so that I could read it and remain far enough from the table that I could actually ring my bells. St. Paul’s has some battery-operated lamps for our music stands, but they seemed not to have fresh batteries, so we did not try to use them. Too bad. I hope to continue as a bell ringer, but I may need a bit of time to recover my composure after my Christmas Eve experience. Perhaps the bell choir will play at Easter. If so, I will refuse to play at the back of the church before a service. On the front page of The Almanac for December 19, 2012, There is a picture of Lou and parishioners lighting candles for the dead of Newtown, Connecticut. The picture is not on the Web, but the text under the 5 x 8 inch photo can be found here. All the windows that were being restored by Williams Stained Glass Studio have now been reinstalled. It is clear that work has been done on the windows, but, as I was not in the habit of studying the windows carefully, I cannot say definitively that they look better now than they did formerly. I am willing to believe that whatever was done was worth doing, however. Generally, the windows look fine, but I do want to raise an issue about one window, the one in the (liturgical) north aisle closest to the narthex. That window is shown at the left. 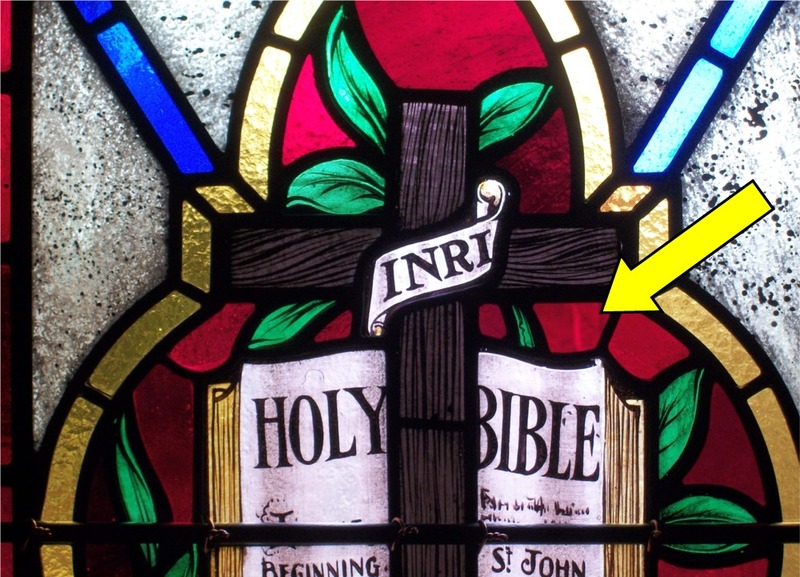 The window depicts the cross in front of a Bible opened to the first chapter of the Gospel According to John. Particularly striking in the window are the panes of red glass. It is difficult to appreciate this glass in the photographs shown here. Like virtually all the glass in the windows in the two nave aisles, it is translucent, but not transparent. That is, one cannot see images of what is outside. The glass is wavy, or contains small bubbles, or has other patterns that make it interesting. In all the windows, I have found a single piece of glass that does not seem to match other panes. This piece of glass, which is only a square inch or so in area, is transparent, red glass with no perceptible “flaws.” Its faces are perfectly flat and parallel, and it is without bubbles or patterns of any kind. One can look through it and see the trees on the church’s lawn quite clearly. The pane in question is indicated by an arrow in the closeup below. Tree branches can be seen through the pane, something more apparent when viewing the actual window, since the scene changes when you move your head. One cannot see images through the pane to the right or through any other glass in the window. I doubt seriously that the transparent pane is original. I suspect that Williams replaced this pane and failed to match the glass in the rest of the window. The mismatch is easy to miss, but it is annoyingly conspicuous once it has been pointed out. St. Paul’s should insist that the errant pane be replaced with a more appropriate translucent piece of red glass. I have no idea why the Memorial Fund authorized $1,000 to buy this unnecessary addition to our liturgical furnishing. (It sits on a brass stand that we already owned and which also cost about $1,000, by the way.) Someone suggested that parishioners have worried that the old wreath might fall down and hurt someone. The same could be said about the lanterns that light the church, however, or the organ pipes cantilevered over the sanctuary on either side of the high altar. As you can see in the picture, the candelabrum currently sports a cheesy wreath, but I am told that a more appropriately sized wreath will eventually circle the central candle. It is difficult not to see the advent of our Advent candelabrum as yet another abandonment of furnishings that have made the church special at St. Paul’s. We now seldom use our elaborate pulpit for preaching. The drama of lifting the lid on the font has been dropped from baptisms; the bowl of the font is now exposed before the service begins. And our spectacular and (at least in my experience) unique advent wreath has been replaced by a standard item from the CM Almy catalogue that can be found in hundreds of churches. The lovely little ceremony of lighting the Advent candles and raising the wreath that once began our Advent services is yet another St. Paul’s tradition that lives only in memory.